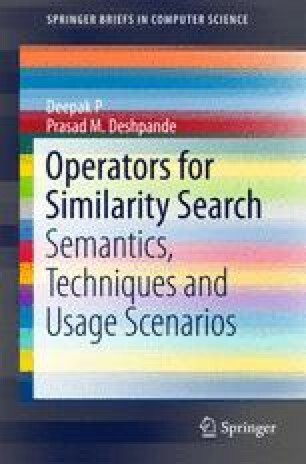 This chapter targets to provide a reasonably comprehensive overview of the various similarity search operators that have been proposed over the last one-and-a-half decades. We consider various advanced operators for similarity search under three heads, (a) those that build upon the weighted sum operation, (b) operators that enhance the basic skyline operator and (c) other modes of similarity search not already covered under the first two heads. We outline each similarity operator by describing the semantics of the operator, followed by a schematic example to illustrate the result set determination under the operator, and end by outlining real-world scenarios that motivate the usage of the operator. We cover more than thirty similarity operators in fair amount of detail in this chapter, forming an extensive overview of the state-of-the-art in similarity operators.